Save the Dates - Smock. 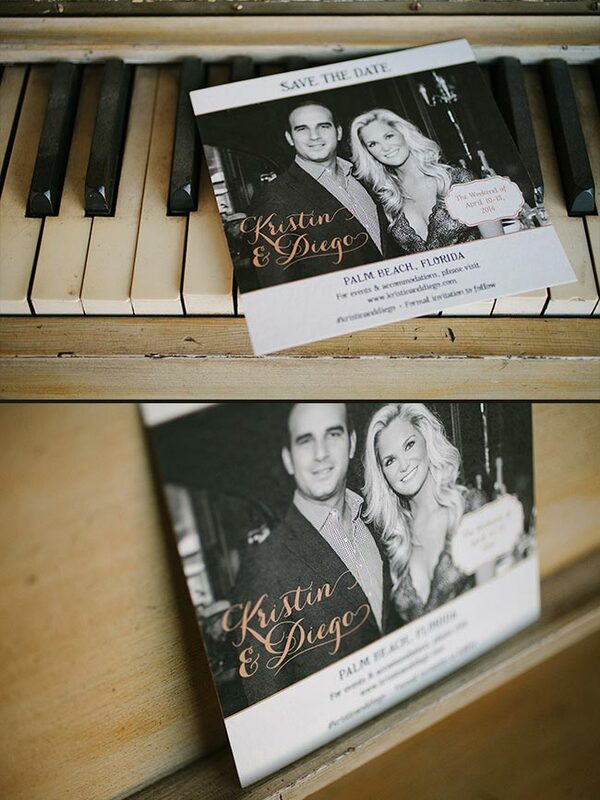 We created these custom photo save the dates for Kristin & Diego’s Palm Beach wedding using one of our newest printing methods – digital printing! Digital printing makes it possible to print photos and lots of colors on our luxurious bamboo paper, but you can also create a monochromatic look with the occasional pop of color, too. 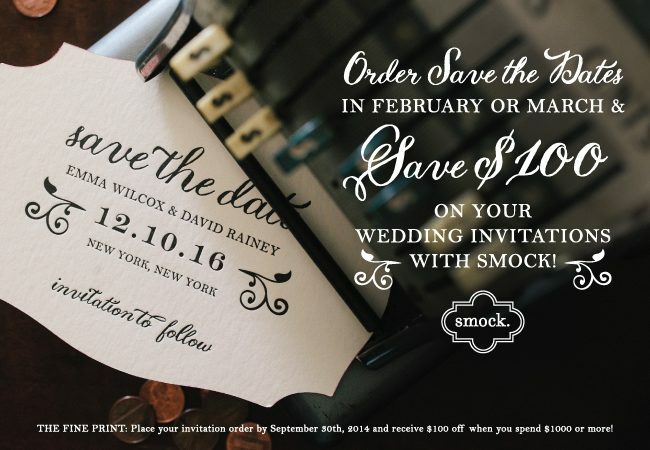 Save $100 on invitations when you order Smock save the dates! Planning a wedding? If you know your wedding date, it’s a great time order save the dates! We’ll give you $100 off your invitation order if you order save the dates in February or March. Invitation orders must be placed by September 30th, 2014 in order to take advantage of this offer. 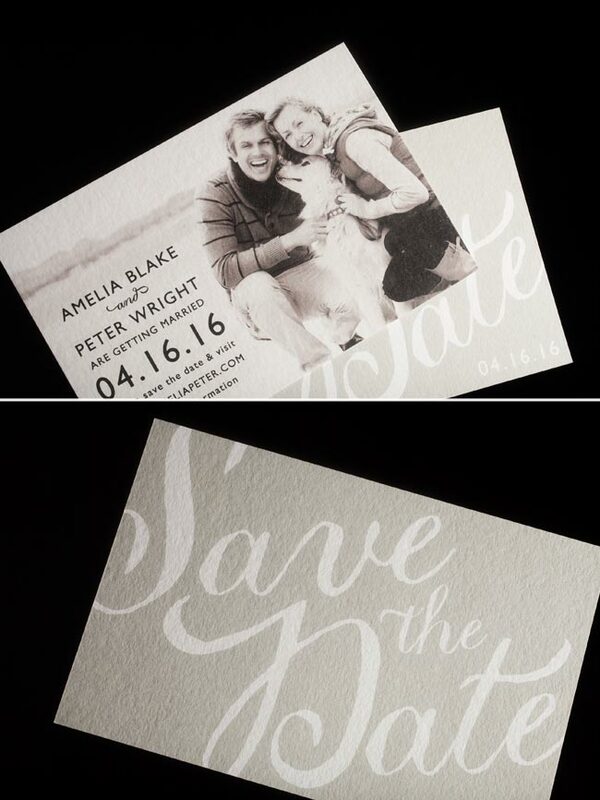 Take a look at some of our favorite save the date customizations below for inspiration! Want to include an engagement photo on your foil stamped save the dates? No problem! 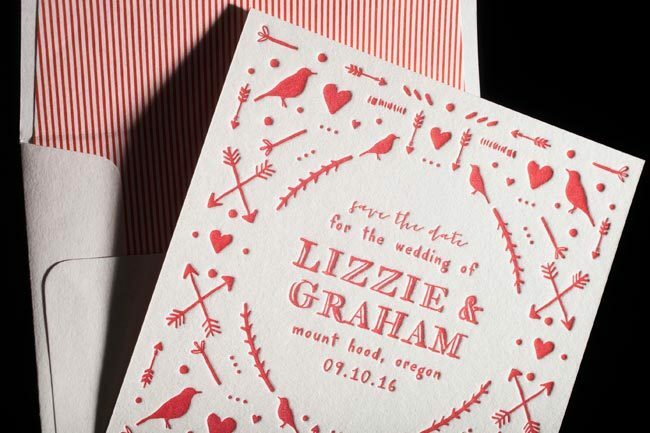 We offer digital printing, letterpress printing, foil stamping and blind embossing — combine all of these printing methods to create the save the dates of your dreams. Visit your local Smock dealer to get started on an order today! Congratulations to the following Smock dealers for being the first 25 to share their favorite save the dates with the world: Annie P Paperie, Creative Parties, Dandelion Patch, Gus & Ruby, Invitations & Company, Inviting Place, Lion in the Sun, Mac and Murphy, Menage Fine Stationery, Oliver’s Twist, Paper on the Avenue, Paper Works and Events, Paperista, Ply, PSI Fine Stationery, RSVP Inc, RSVP Today, Shindig Paperie, Smitten Boutique, Southern Niceties, The Stationery Station, Therese St. Clair, Urban Coast, Village Invites, Your Occasion Invitations. Our purple shine foil stamping makes these save the dates & thank you cards stand out – in a good way! Submitted to us by our friends at The Village Invites in New York City, we adore the playful type on the Tatra design. Our friend JoEllen at Bennett Schneider, Inc. in Stilwell, Kansas submitted these gorgeously grommeted save the dates for printing. Offset printed in our ocean and glacier inks, the save the date swivels so guests can read up on lodging and travel information. We think you’ll agree that a cool color palette and our babine pattern is what makes these particularly charming. 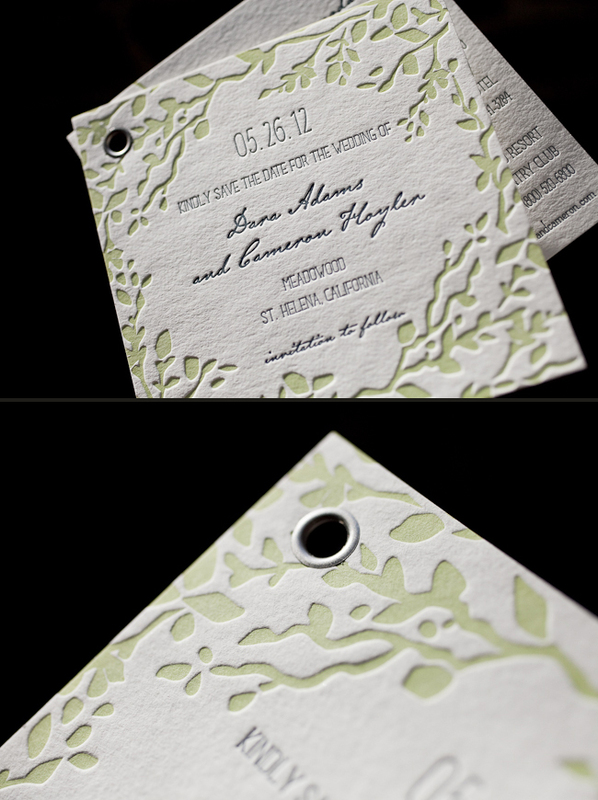 We’re excited to share these letterpress Dawson save the dates with you. 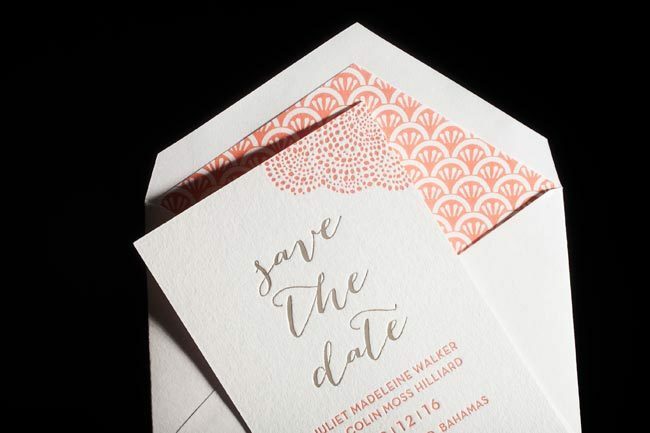 Printed in gold and cherry inks, these save the dates set the perfect tone for an autumn wedding. Our Bescal calligraphy font was used for the couple’s names, which added even more character to this set. Many thanks to our friends at The Dandelion Patch – Georgetown for sending us these beauties! Does it get any cuter than this? Take a look at these absolutely stunning save the dates submitted to us by our wonderful friends at Union Street Papery in San Francisco, California. Hole drilled with beautiful silver grommets attached so as the save the date swivels, you can read up about accommodations for the wedding weekend! 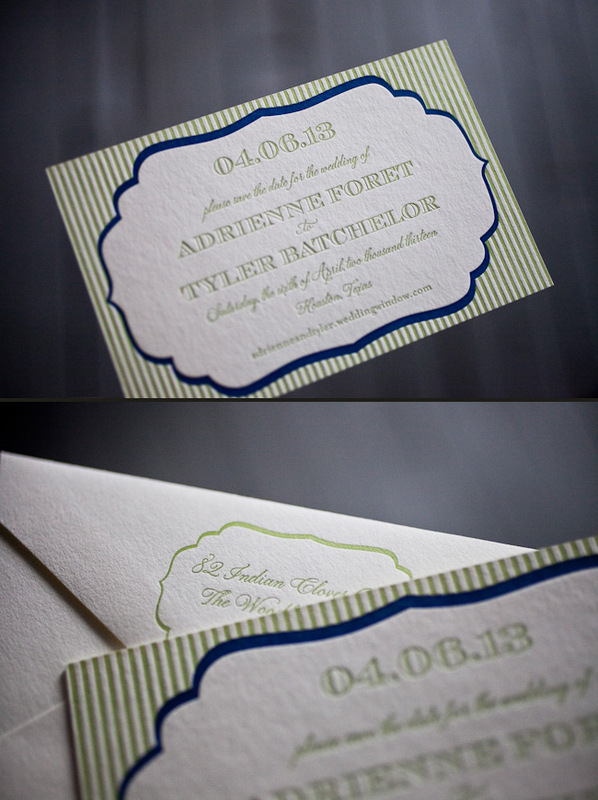 Our Robson design looks chic letterpressed in our spring and midnight inks. We know we don’t have to tell you that these days everyone has busy schedules! So this is all the more reason to send save the dates as soon as you’ve set the date! Save the dates are a great way to give your guests advance notice of the wedding date so you can be sure they’ll be in attendance for the big day! We’re over the moon for these because the surprise accommodations card truly allows your guests to begin their own planning. 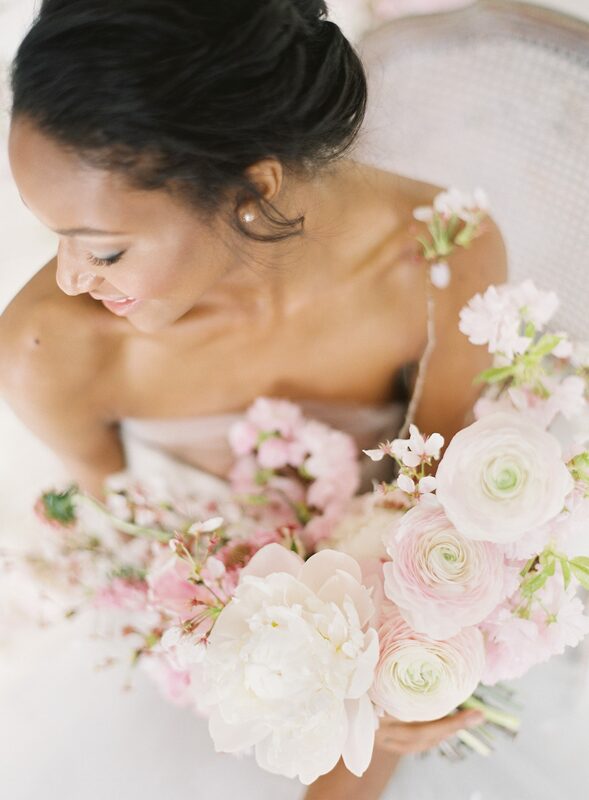 This couple’s wedding is during Memorial Day weekend – which is all the more reason to make sure to catch people before they’ve already made plans of their own! 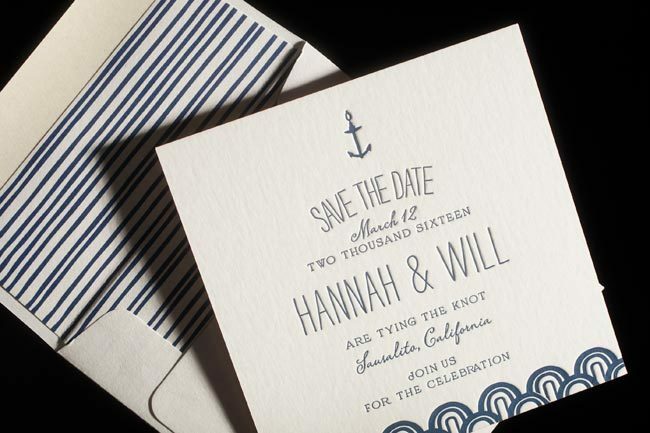 It’s easy to get swept away in these beautiful and delicate letterpress save the dates. 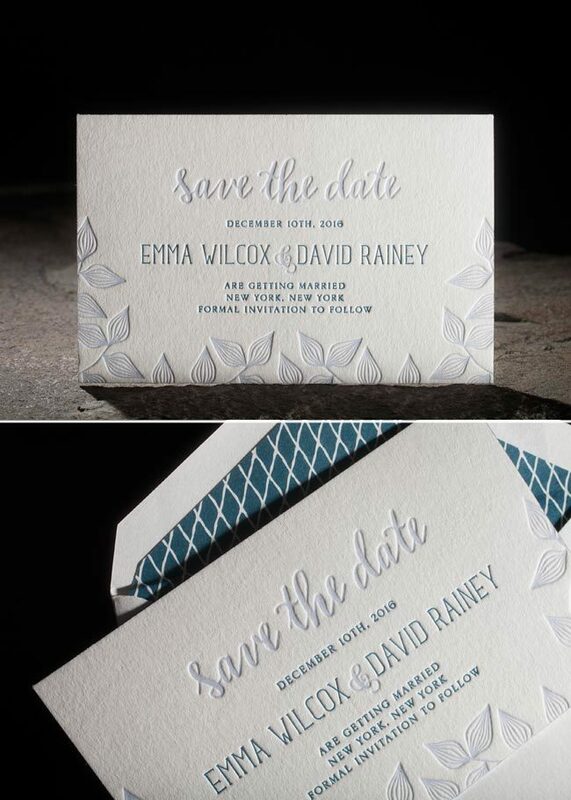 These beauties were submitted to us by our great friend, Nancy at Epitome Papers in Edina, Minnesota. 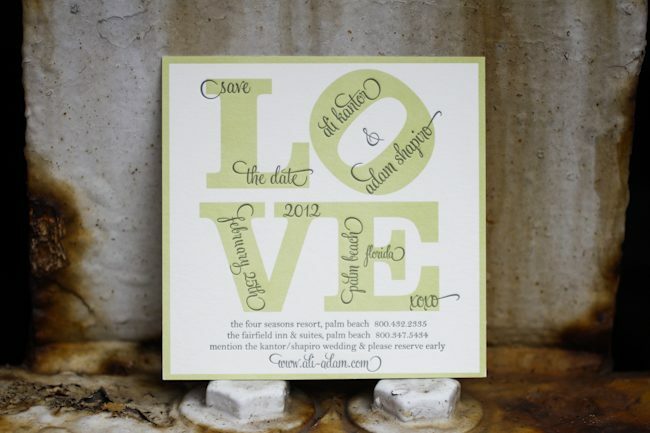 We think you’ll agree that these save the dates are current and look absolutely fabulous printed in three ink colors. The oversized textured starfish is the perfect motif for a seaside wedding in Key Largo, Florida. These save the dates are whimsical in their own right – while still being playful and chic. 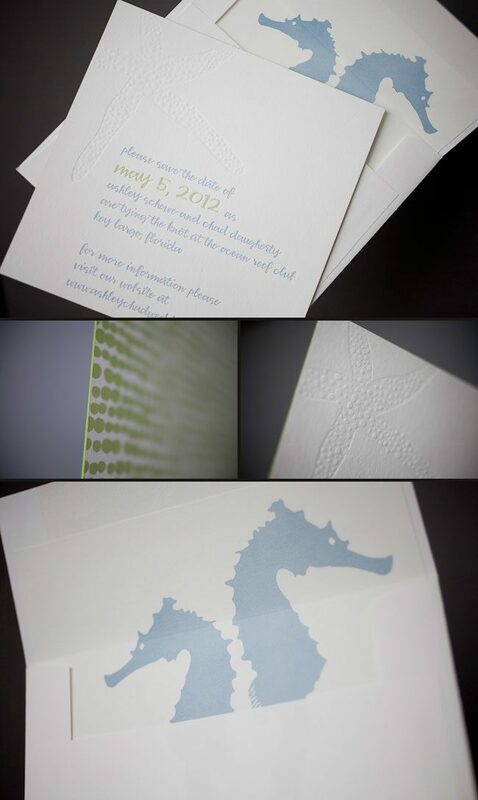 The seahorse pattern envelope liner really makes a bold statement of what guests can expect as far as wedding atmosphere. We can just close our eyes and feel the warmth of the golden sunshine and the white sandy beaches! How do you outdo an awesome save the date? Our good friend Niki at Papery & Cakery in Boca Raton, Florida has the recipe. We posted these lovely save the dates for Niki’s sister back in September!!! Now that the wedding has passed, we are able to show you the amazing suite she designed, and we couldn’t be happier to share these with everyone! 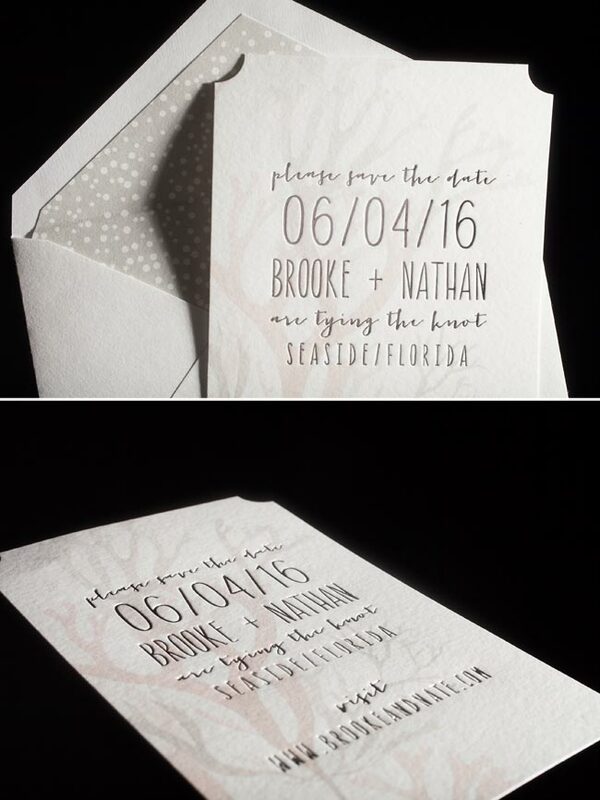 The suite was letterpress printed in our Pewter ink on our beautiful white bamboo 2-ply paper. All of the pieces were fitted with an offset border in pewter and die-cut in our new Chesapeake design. Each piece has a decorative offset backing and is finished with perfect edge painting in Pewter. The invitation, reply cards, and events card are tucked nicely into a custom offset sleeve. Cori at Social Graces in Nashville, Tennessee sent us this adorable Odin customization! These offset printed save the dates are both personalized and creative, and were printed in a very cool color palette of our sea mist + grass inks. When we asked Cori what inspired this design she told us that the bride was drawn to the fun font style and whimsical frame, and loved how these elements balanced the striped background. The wedding reception will be on her family’s horse farm, so the couple thought it would be appropriate to include a horseshoe. Here at Smock, we believe these save the dates are lucky! Common legend is that keeping the ends of a horseshoe point up keeps all of the good luck in. Congrats to the lucky bride and groom, and bravo to Social Graces for such an inspired design!